Table dance refers to the movement of a table during a seance. If such occurs without equipment or contact, we call it telekinesis or psycho kinesis. Participants (with a medium) sit at a table, on which they lay their hands very loosely. They evoke a spirit (of the deceased). After some time, the table starts to move and tap with leg on the floor. According to a permanent appointment one smack goes for ‘a’ , two taps ‘b’, etc. In this way, messages can come through. Another way to record these messages is spirit board. This flat board is a small board that runs on three balls and moves easily. In the middle is a pin. Which is writing on a big sheet on the table. Two people (one medium) lay their hand on the ouia. Dancing on the table is less sinister and more festive. It usually happens when the cat's away. Due to the mice. Musical chairs is a party game. There are several variations. There are a number of chairs placed in a circle, wherein is one seat less than the number of participants. During the game, music is played. Each time the music stops, the players try to sit down ASAP on an empty chair. Who has no seat falls off, until a participant remains as the winner. 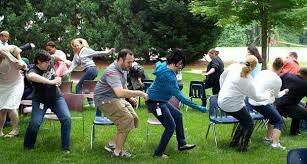 There are many situations in society that resemble a game of musical chairs. A well known example is a reorganization which reduces the number of jobs. Also in politics is a game of musical chairs arranged, as in elections for the placement of candidates on a list, or government formations, as we have very often in (Belgian) politics (with his seven governments). It sometimes seems as if the seats are already pre- distributed. It's always a competition with more participants than open places. Mirror Dance: two mime artists face each other. One moves, the other mimics the mirror as closely as possible, so it looks like it there is a (n intermediate) mirror.